Who is it for? 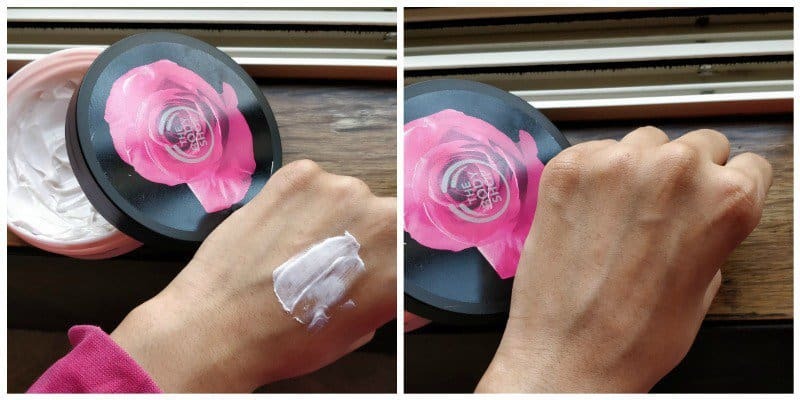 The body shop British rose body butter is perfect cream for your skin. Just one application and your skin remain soft and supple throughout the day. It hydrates your skin well and its smell is just a cherry on the top. It is suitable for all types of skin. People with sensitive skin can also use it. I’ve used many body butters from The Body Shop and this is the body butter I prefer the most. My first thought about the product was the packaging. The box is of good material and doesn’t encourage spillage of the cream. The cream is easy to apply though it’s thick it slips smoothly on your skin. The cream is shiny. The body butter has rose like the smell and is long lasting. You don’t have to keep reapplying the cream and it stays on your skin all day long. It’s not sticky. It’s the best winter cream one can use. I’m totally in love with the cream. As I mentioned it’s the best one can have for winter. One box will go throughout your winters and will keep your skin nourished. I obviously recommend it and everyone should try it especially if they have a dry skin. I would repurchase it. More from Body Shop British Rose Range? Loved your review Sanskriti. Buying this one for sure..
Yeah !!! Again a great product of body shop !!!! Will surely buy this !! !